There’s a wonderful quote over on the sidebar about writing what your passion is. I think every writer out there has heard the phrase, ‘write what you know’. How often are we told to write what our passion is? And are they the same? I wanted to write a western several years ago. The idea still sounds good and that western is still floating around inside. But when I tried to write the story, it kept dying. At the time I thought it was because I wasn’t writing what I knew. I’d never been on a wagon train. Research didn’t help. The stories that work for me are set in the mountains. I figure that’s because it’s where I live and what I know. But it’s much more than that. I am drawn to mountains and whitewater and trees. Well, trees are really a passion. I live in the forest and yet plant more trees. Earlier there was a discussion on voice and rhythm, and this kind of follows along the same line. Do I write stories set in the mountains because I know them, or because they are my passion, or because passion and knowledge are the same thing? I have no idea. What I do know is that the mountains bring stories to me. They are mysterious, full of the unknown, of challenge, of scary things and uplifting things. 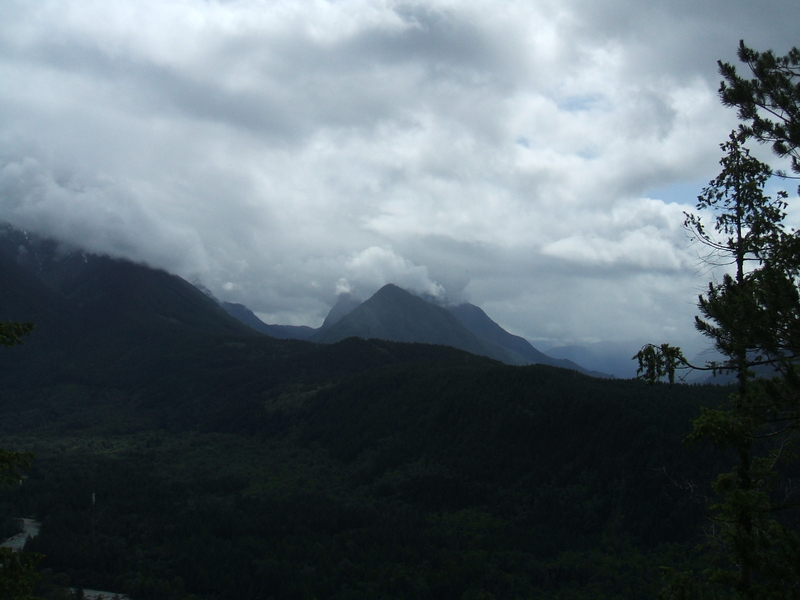 When mountain tops are shrouded in sinking, rain-heavy clouds it’s easy to imagine Bigfoot up there. When you are alone in the woods and the light slants through the forest canopy just so, your heart soars. When you are alone in those same woods and something big and black moves through very close, grunting and foraging, your heart stops. The place is fertile ground for stories to sink roots and grow. When I have tried to write stories set elsewhere, they seem flat to me, missing that magic. I’ve been to the high mesas and badlands of northeastern Montana, the rocky Oregon coast, northern Scotland, and Dublin, Ireland. All could be locations for stories some day, and I have drafts set in some of those places. But right now, what pulls words out of me is the temperate, lush rain forest of mountains. And the stories I write that are set there feel more alive, more compelling, to me. Yes, the knowledge of place, characters, plot, etc. is important. But what is knowledge without heart? Like voice within rhythm, a story must have passion within knowledge. I know this must seem obvious to writers out there, but sometimes we need to restate the obvious in order to resurrect or honor that passion. Also, for me, my Western was always supposed to be more about the way the words hung together and evoked what I saw in heads of the characters and their surroundings. It turns out, I just wasn’t able way back then. Now that I am, I recognize that few may want to read that book, so I have to attend to a couple others first. That one will be my dream book, the one I do just for me. A very thoughtful piece and I definately agree. You need to have passion in what you are writing; to be immersed in it. The most natural way is by writing what you are passionate about, but immersion can also come through imagination and / or research. But then you need the knowledge to be able to communicate your passion, else it remains just like a dream – vivid in your own head, but not a lot of sense to others! I really like your point about needing knowledge to write passion. And I can’t tell you how many times I’ve written something that I thought was clear, and in the editing process found it to be muddy!